This is the story of Percy Jackson, an urban boy dealing with his crass stepdad, lack of friends, and learning disabilities. Oh yes, and the memory of a math teacher that turned into a monster and tried to kill him. But at least he has one teacher, Mr. Brunner, who seems to like him and a friend, Grover. Okay, so a friend with a body odor problem and learning disabilities of his own and a tendency to eat odd things, but still a friend. In the wake of that attack (and other strange events), Percy finds out who he really is: a half-blood. Half human (on his mother’s side) and half God (on his father’s side), and all the monsters of Greek myth want to kill him. All he has to do is to reach Camp Half Blood and he’ll be safe. Or that’s what he thinks. With his mother and Grover, Percy takes off for the Camp in his step-father’s stolen car. Enroute, Percy discovers that Grover has been following him to protect him and is really a satyr. And Mr. Brunner, his favorite teacher, is a centaur. Just outside the boundaries of the Camp, they are attacked by a minotaur. Percy manages to defeat the monster, but not before his mother is killed. At Camp Half-Blood he has to try to fit in with a crazy bunch of Half-Bloods and begins to understand what his powers are and what it means to be the son of a God. He also discovers his special destiny and is warned about a coming war among the Gods. Of course, this leads to a quest with Grover and the beautiful Half-Blood Annabeth (daughter of Athena) to enter the underworld, save the mortal world, and get his mother out of Hades. If this sounds clichéd, it is. It’s only the strength of the writing and characterization that makes this worth reading. The constant rocketing from one crisis to the other can make things seem repetitive. While the fight in the St. Louis Arch is well-written and confirms what I’ve always thought about purse dogs (they’re miniature chimeras in disguise), it doesn’t seem to add anything to the overall plot. 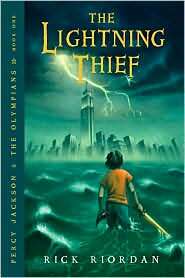 It was interesting to see how closely this follows the story of Odysseus, with twists that brought fun to the story. The Lotus Casino was a touch I loved; it is the ultimate temptation, a Las Vegas casino with everything you could want. Each character’s choices make perfect sense, with Annabeth building a city, and Grover hunting hunters. I loved the use of Medusa’s head at the end, too. The good news is that as the series continues, the good writing continues but the flaws lessen. It is also a great way to introduce kids to Pagan myths. If you want something more adult, but similar, I suggest The Odyssey (pick a 20th/21st century translation) as your best bet. But the main thing that this book left me with was the wish that someone would write a similar book featuring the Norse pantheon. Please, soon. Very fair review. Neil Gaiman has written a lovely young adult novel called “Odd and the Front Giants” which reverently features several Gods (and Giants) from the Norse Pantheon. I highly recommend it!